There are days, fortunately not too many of them, when I really miss the quiet life that I led before moving to Paris...and yesterday was one of those days. For there I was, on my way to the tea ceremony at the Buddhist Pavillon at the Musée Guimet when I turned the corner and ran smack dab into a union demonstration. At first I thought, "Oh, good - a photo opportunity!". But when there was an ear shattering explosion, I thought, "Oh, @#@# - maybe I should get out of here!". Considering my options, I realized that the only way for me to get from where I was (Point A) to where I needed to go (Point B) was to cut straight through the center of the crowd. So, with my camera slung around my neck, I set off into the melee. After finally making it to the Musée Guimet, I felt like Dorothey in the movie, The Wizard of Oz, when she says, "Toto, I've a feeling we're not in Kansas anymore" because I'm certainly not in the sleepy Swiss town of Montreux anymore. What was most interesting is the way that the French people reacted to the demonstration. For while we were sitting in the Buddhist Pavillon and listening to the explosions, one of the women asked another what time the demonstrators were going to start marching. The other replied, "They should have started at one o'clock, but I guess that they haven't finished eating their sausages yet." Yes, food does come first in France! CGT, which is the union for the employees of the SNCF, was demonstrating for a general increase of wages, benefits, pension, and unemployment benefits; to forbid the imposition of part-time work; to forbid any kind of time limited work contracts; and for the equality of wages for men and women. 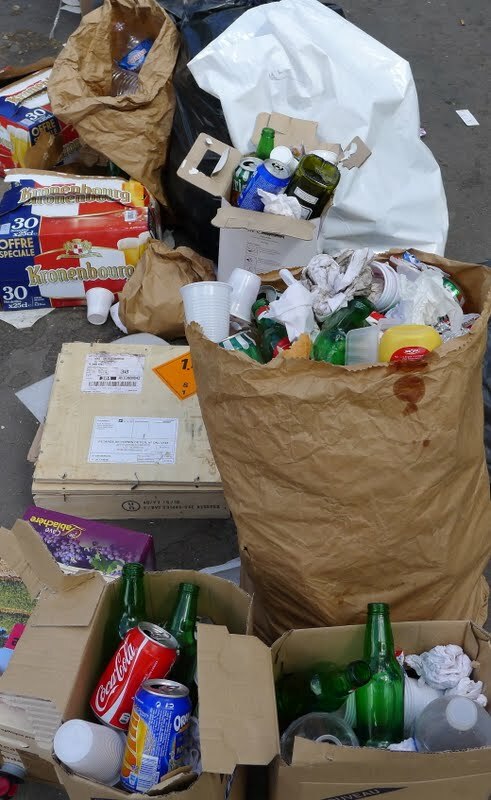 The remnants of the demonstration, stickers and garbage, when I left the Musée de Guimet a couple of hours later. Mon beau et moi, once coming down the hill from Sacre Coeur hit smack-dab into a demonstration led by North Africans. I was fascinated and wanted to watch for a while but he insisted that we get out of there, maintenant. So we did. And I've also been in Paris when some big union was protesting and we took refuge in the Comme des Garcons store near Place Vivienne, or something like that. In general, I can live without demonsrations--all the noise. You have a clever beau. When I told Stéphane about my day and showed him the pictures, his one question was why I didn't take a different route to the museum. As there wasn't another way to get there, it's good that it was relatively calm and that the loud explosions weren't bombs! The Galeries Vivienne (oddly enough not near the Place Vivienne) is one of my favorite spots in Paris.